Born in Den Briel, Tromp was the son of an officer of an early Dutch man-of-war;his mother washed sailor's shirts to supplement the family income. At the age of nine, Tromp went to sea with his father and was present at the Battle of Gibraltar. Three years later they sailed together on a merchant ship to Africa, when they were attacked by the English pirate Peter Easton and Tromp's father was slain. According to legend the 12-year old boy rallied the crew of the ship with the cry "Won't you avenge my father's death?" But the pirates seized him and sold him on the slave market of Salé. Two years later however, Easton, moved by pity, ordered his redemption. Set free, he supported his mother and three sisters by working in a Rotterdam shipyard, went to sea again at 19, and three years later was captured once more — this time by Barbary corsairs off Tunis. He was kept as a slave until 24, and by then had so impressed the bey of Tunis with his skills in gunnery and navigation that he was again set free. He joined the Dutch navy as a lieutenant in 1621. His first distinction was as Piet Hein's flag captain on the Vliegende Groene Draeck during the fight with Ostend privateers in 1629 in which Hein was killed. Tromp, left the naval service for a few years, but was promoted from captain to Lieutenant-Admiral of Holland and West Frisia in 1637, when Lieutenant-Admiral Philips van Dorp and other flag officers were removed for incompetence. Although formally under the Admiral-General Frederick Henry of Orange, he was in fact supreme commander of the Dutch fleet, as the stadtholders never fought in naval combat. Tromp was mostly occupied in blockading the privateer port of Dunkirk. In 1639, during the Dutch struggle for independence from Spain, Tromp defeated a large Spanish fleet bound for Flanders at the Battle of the Downs, marking the end of Spanish naval power. In a preliminary battle, the Action of 18 September 1639, Tromp was the first fleet commander known to deliberately use line of battle tactics. His flagship in this period was the Aemilia. 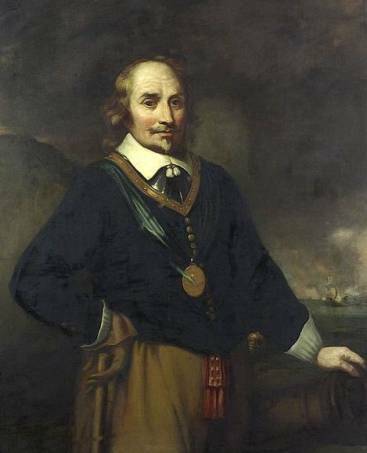 In the First Anglo-Dutch War of 1652–1653 Tromp commanded the Dutch fleet in the battles of Dungeness, Portland, the Gabbard and Scheveningen. In the last of these, he was killed by a sharpshooter in the rigging of William Penn's ship. His acting flag captain, Egbert Bartholomeusz Kortenaer, on the Brederode kept up fleet morale by not lowering Tromp's standard, pretending Tromp was still alive. The death of Maarten Tromp was not only a severe blow to the Dutch navy, but also to the Orangists who sought the defeat of the Commonwealth of England and restoration of the Stuart monarchy; Republican influence strengthened after Scheveningen, which led to peace negotiations with the Commonwealth, culminating in the Treaty of Westminster. During his career, his main rival was Vice-Admiral Witte de With, who also served the Admiralty of Rotterdam (the Maas) from 1637. De With temporarily replaced him as supreme commander for the Battle of Kentish Knock. Tromp's successor was Lieutenant-Admiral Jacob van Wassenaer Obdam. One of Tromp's sons, Cornelis Tromp later also became commander of the Dutch navy, as Lieutenant-Admiral-General, and even earlier commanded the Danish navy. Tromp was born in Rotterdam, the second son of the later Lieutenant-Admiral Maarten Tromp and Dignom Cornelisdochter de Haes. In 1642 he was sent to Harfleur in France to learn the language from a calvinist preacher. On 1 September 1643 he joined his father on his flagship the Aemilia. In September 1645 he was appointed as lieutenant. On 22 August 1649 he was made a full captain. He served in the First Anglo-Dutch War, fighting in the Battle of Leghorn, but wasn't given command of the Mediterranean fleet after the death of Johan van Galen, only being promoted to Rear-Admiral with the Admiralty of the Maas on 11 November 1653 after the death of his beloved father Maarten. In 1656 he participated in the relief of Gdańsk (Danzig). In 1658 it was discovered he had used his ships to trade in luxury goods; as a result he was fined and not allowed to have an active command until 1662. 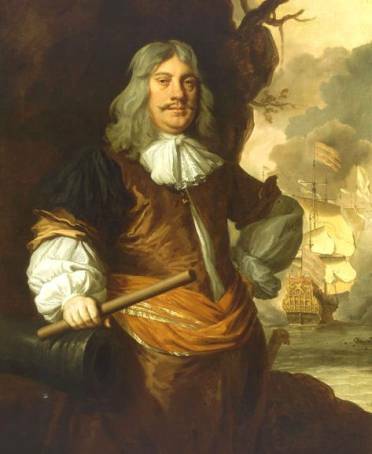 Just before the Second Anglo-Dutch War he was promoted to Vice-Admiral on 29 January 1665; at the Battle of Lowestoft he prevented total catastrophe by taking over fleet command to allow the escape of the larger part of the fleet. Gaining thus a sudden popularity he was then on 23 July 1665 temporarily given supreme command of the confederate fleet as Lieutenant Admiral, but had to give up this function (but not rank) the next month in favour of Lieutenant-Admiral Michiel de Ruyter; he fought, having been transferred to the Admiralty of Amsterdam on 6 February 1666, under the latter in the Four Days Battle and the St. James's Day Battle. As this failure off Nieuwpoort in August 1666 was imputed to him by De Ruyter he was dismissed, at the same time being under the suspicion of plotting to overthrow the government, but he returned in April 1673, after the Orangists seized power, to fight against the French and English navies in the Third Anglo-Dutch War where he participated in the last three fleet actions under Lieutenant-Admiral-General Michiel de Ruyter, distinguishing himself in the double Battle of Schooneveld and the Battle of Texel in August 1673 fighting out an epic duel with his personal enemy Edward Spragge, who drowned. He was closely involved in the murder of Johan de Witt and Cornelis de Witt in 1672. In 1675 he was created a baronet by Charles II of England but he refused an honorary doctorate when visiting Oxford. On 8 May 1676 he became Admiral-General of the Danish navy and Knight in the Order of the Elephant; in 1677 a Danish count. He defeated the Swedish navy in the Battle of Öland, his only victory as a fleet commander. On 6 February 1679 he became Lieutenant-Admiral-General of the Republic but never fought in that capacity, having become a liability to the new regime of William III. He died in Amsterdam in 1691, his mind broken by alcohol abuse and remorse, still officially commander of the Dutch fleet, after having been for a period replaced by Cornelis Evertsen the Youngest. Tromp no. 1 - A 54-gun ship of the line under the admiralty of the Maze (1777-1796) with the full name of Maarten Harpertsz Tromp. P. van Zwijndregt built it on the stat Warf at Rotterdam. It made its maiden voyage under the command of Captain C. van Gennep and joined the fleet at Texel. On February 23, 1796, the Tromp set off with seven other ships for India, under the command of Rear Admiral E. Lucas. 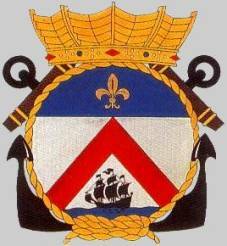 This squadron surrendered on August 17, 1796 in the Saldanha Bay to the English fleet under the command of Vice Admiral G. Keith. Afterwards, the ship still under the name Tromp served in the British Navy and was sold for scrap on August 9, 1815. Tromp no. 2 - The armed schooner number 22 (1809-1826) which was built in 1804 as the Admiral C. Tromp was armed with seven cannons with a crew of 50 men. In 1805, the ship took part in the expedition to Vlissingen. On august 30th, 1826 the schooner was sold for NLG 530 ($ 340) for scrap in Rotterdam. Tromp no. 3 - In 1805 the 64/68 gunship of the line Maarten Harpertszoon Tromp (1808-1823) was laid down in Rotterdam, launched in 1808 and put into service un Captain I.A. van der Straten on May 5th, 1811. In 1820, the Tromp was rejected and sold to the colonial Navy. In 1823, the ship was scrapped in Indonesia. Tromp no. 4 - 74 Gunship of the line (1850-1867). P. Shut jr. laid down the hull in 1830, but it was not launched until twenty years later. The ship was never actually sailed and was removed form the fleet in 1867 and sold for scrap in 1872. Tromp no. 5 - The 1st Class screw-driven steamship Tromp (1877-1904) was built at the state wharf in Amsterdam and put into service under Captain H.D. Guyot on May 30, 1879. The ship was built of steel with a wood covered hull. Although steam powered, it had auxiliary sails with as surface area of about 1600m2. The ship was taken off the fleet in 1904 and sold for scrap in September 19, 1904. Tromp no. 6 - The Maarten Harpertszoon Tromp (1904-1933) was built at the state wharf in Amsterdam and put into service on April 5, 1906 commanded by Captain F.C.E.L. Koster. In the last 4 years of her service, the ship served as a training vessel before being replaced in 1927 and sold for scrap in 1933. Tromp no. 7 - The HM Tromp was the flotilla leader of the Decker's fleet plan, which was introduced in 1931. It was however not until January 17 1936, that the first keel plates were laid down at the Netherlands Shipbuilding dockyard in Amsterdam. During World War II the ship saw a lot of action in the Indian waters and the southern part of the pacific. 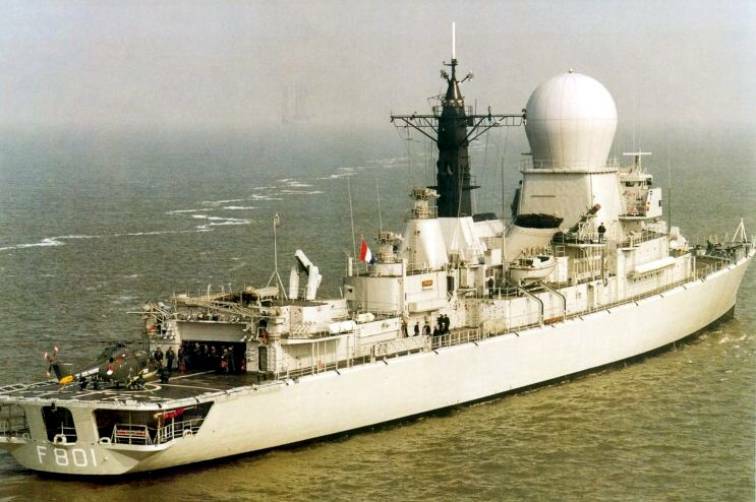 In 1949, the ship was reduced to a technical training ship for the Royal Dutch Navy. Tromp no. 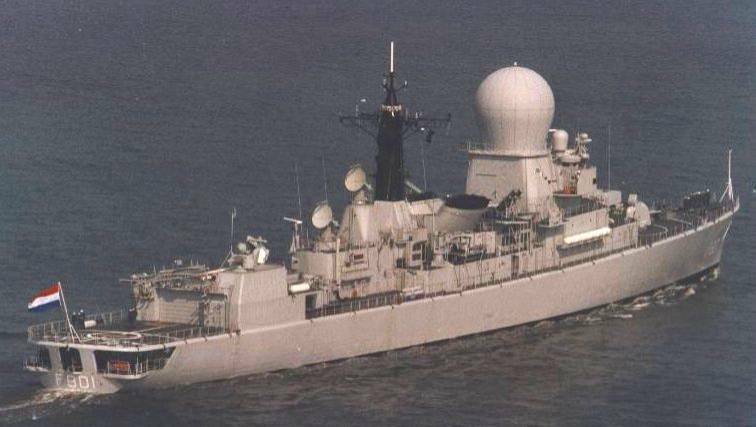 8 - The guided missile Frigate HNLMS Tromp (F 801), a "Tromp"-class area-air-defense Frigate, was laid down on August 4, 1971 by the Royal Schelde in Vlissingen and commissioned in October 1975. 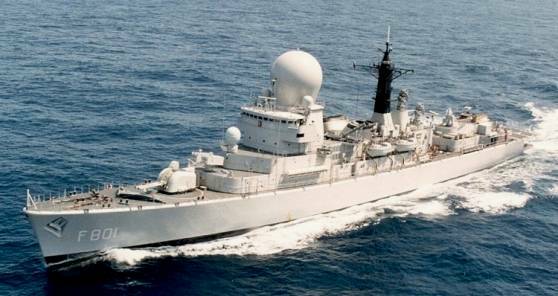 In 2001, the ship was put out of service and in being replaced by the ADCF.